On the second day of the Colombia State Visit, members of the Royal Family joined President Santos and Mrs Santos for a series of events in London. The day started with a breakfast business meeting for the President at Buckingham Palace, before the President departed for the Natural History Museum. ​Under the gaze of the Museum's statue of Charles Darwin, The President was greeted by The Prince of Wales. 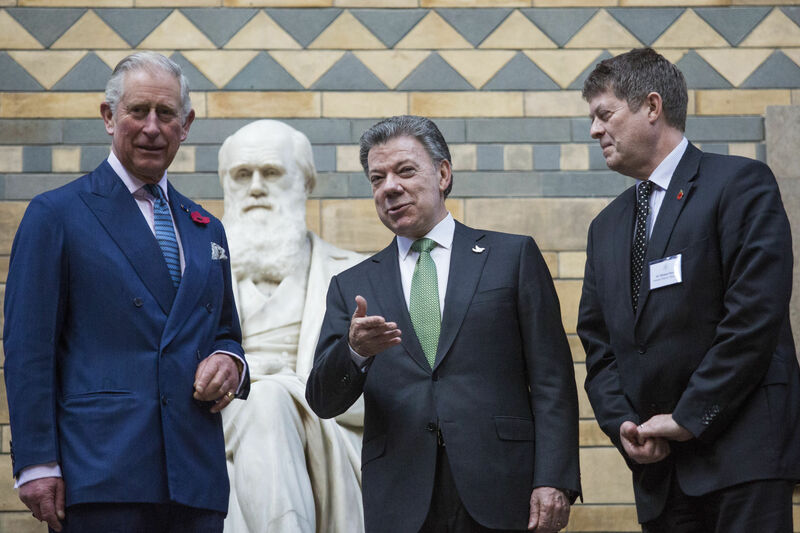 The Prince and The President toured part of the museum and viewed items from Colombia on display before attending a meeting to discuss the UK – Colombia bilateral relationship on the environment. ​Meanwhile, Mrs Santos spent the morning with The Countess of Wessex visiting the Vanessa Nursery School and Cathnor Park Children's Centre, in west London for a music session. At the centre The Countess and Mrs Santos met Vanessa Redgrave, who founded the nursery school, and found out how it provides care are education for families. Prince Philip and I are delighted to be back in Trinidad and Tobago after more than twenty years, renewing our happy association with your country. Relations between our two countries are built on strong and deep foundations, and are set fair for the 21st century.